What Would You Like To Record? Click this button to select what you want to record on screen (video source). Options are Full Screen, A Window, A Region, Picture In Picture, Auto-Pan and Preset Regions. 2.1.1. Preset Regions : Preset regions can be defined by the users. Click New Preset button to create a new region. Enter the screen coordinates of the regions you want to save or click Select Region button to select it on the screen. Finally click Save button to save the preset region. Click this option to activate the WatchIt mode. 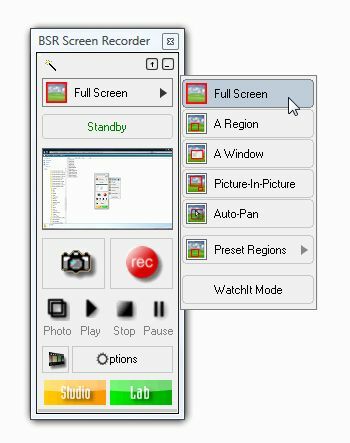 During recording, when the WatchIt mode is activated, BSR Screen Recorder watches the selected source for any change and records only when the content of the source changes. 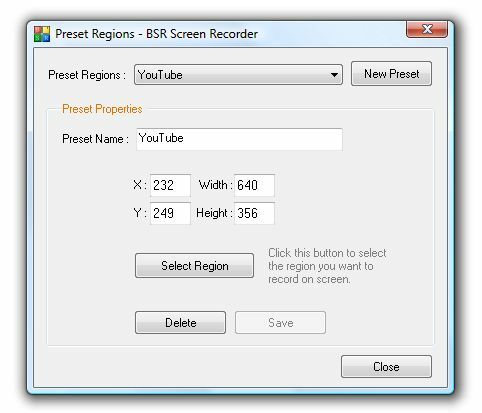 For example when a window is selected for recording, BSR Screen Recorder records the window when a change/movement in the window/scene occurs. Otherwise it pauses itself and waits for any change in the window's contents. This feature can be used in order to record a video stream from the internet. The program only records when there is action in the video stream and pauses/unpauses itself automatically according to the incoming stream. Opens the last recorded video with the default media player. Stops recording. Also closes the red frame (region markers) when opened just after region selection. Records while the button is held down, pauses when released, and continues recording when held down again. Takes picture of the selected region of the screen and by default, saves them into 'Photos' directory as JPG files. Photo format can be changed to JPG, PNG or BMP. These files are kept in the Photos directory until you delete them. You can handle these photos in Photo Studio . The drawing mode (smooth or sharp) used during the picture capture can be changed in Other Settings in Configure->Options tab->Other Settings . The location of Photos folder can be changed from the File tab in configuration. The number of the photos you have taken before is shown in the Info panel of the main interface. You can reset the photo number by clicking on the Reset Button. The Reset Button does not delete the existing pictures but it resets the reference number and therefore begins to save over to the existing pictures if there are any. 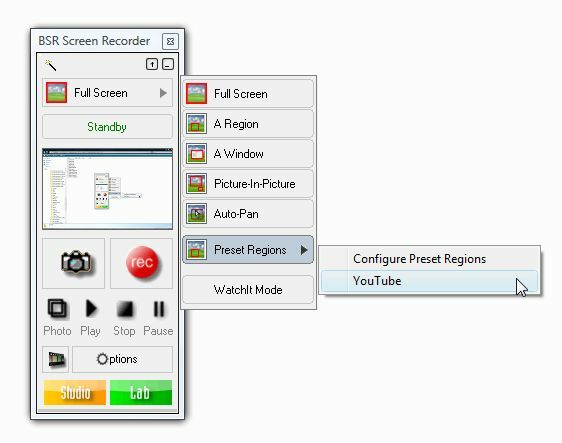 BSR Screen Recorder main interface is designed for easy use. Shortcuts for the mostly required BSR settings exist on the main interface.